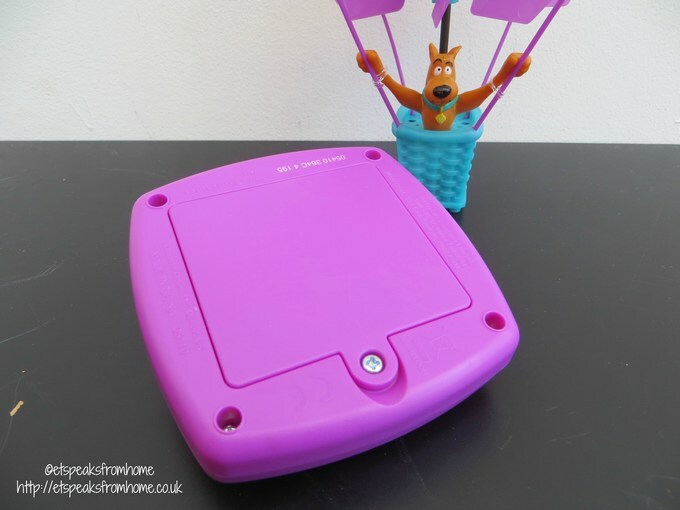 Fancy taking a flight with Scooby on his glow in the dark phantom flyer? Now you can take him on a wild ride by navigating with your hand. Watch him fly everywhere into the air and see it glow dark when in a dark room. Scooby Doo Phantom Flyer is suitable for aged 5 and above. The flyer is made from light plastic with ringed rotor blades to make it safe for young hands. My son did manage to accidentally stick his fingers in while it was flying but luckily nothing happen! But within a few plays, one of the thin plastic rings on the hot air balloon snapped. It requires 4 AA batteries for the charging base and it take 30 – 40 minutes each time for a full charge. There is a purple light which blinks on the top basket when it is charging and it will stop when it is fully charged. It can fly up to 2 metres high and flies for 4 minutes per charge. The on/off button can be found on the bottom of the basket. Once turned on, place it on your palm and wait for a second or two. It will take off very quickly. The motor blade is quite loud when it flies. My children had to keep chasing after the flyer. It does hover over the floor without it touching the ground and frequently flies very low. We played with it in a darkened room to watch it glow but we found it hard to see where the flyer was and the glow was not very bright at all. 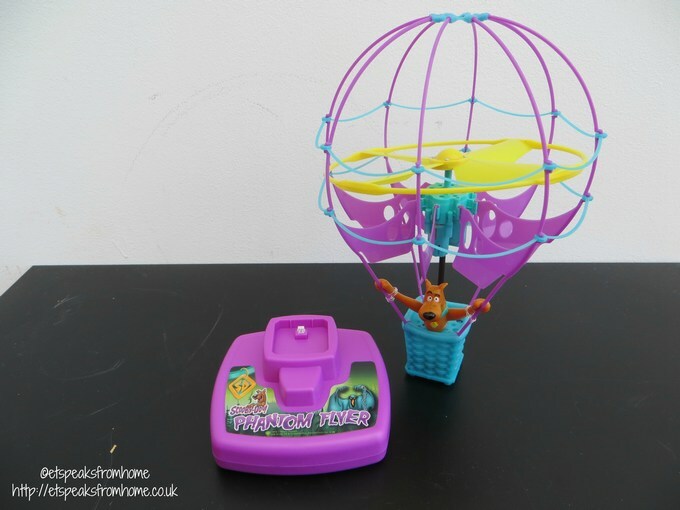 Overall this is a fun toy that is quite loud and has similar features to the flying fairy but this flyer is able to maintain its balance much better than the flying fairy. The noise did scare the children initially but after a while they got use to it had fun catching it. The RRP is £19.99 which is very reasonable price but shame about the quality of the plastic on the balloon as it snapped quite easily. This is Mr K showing us how the phantom flyer works and what he thinks about it!